Sets will be available April 13. • Includes 4 minifigures: an Imperial Recruitment Officer, Imperial Emigration Officer and 2 Imperial Patrol Troopers. • Features a speeder with a minifigure seat and 2 stud shooters. • Also includes 4 stud blasters for the minifigures. Recreate high-speed LEGO® Star Wars action scenes from Solo: A Star Wars Story with Han’s Landspeeder. Featuring an open 2-minifigure cockpit, opening hood with storage compartment, removable engine, rear storage compartment with secret cargo, hidden wheels for a hover effect and 2 spring-loaded shooters. • Includes Han Solo and Qi’ra minifigures, plus a Corellian Hound figure. • Features an open 2-minifigure cockpit, opening hood with ammo and accessory storage, removable engine, rear storage compartment with secret cargo, hidden wheels for a hover effect, and 2 spring-loaded shooters. • Remove the engine for a much-needed overhaul. • Also includes 2 blaster pistols. • Measures over 1” (5cm) high, 6” (16cm) long and 3” (10cm) wide. Recreate action-filled scenes from the Solo: A Star Wars Story with this LEGO® Star Wars Moloch’s Landspeeder set. The vehicle features an open minifigure cockpit, storage hold at the rear and hidden wheels for a cool hover effect. This Star Wars toy also has a 6-stud rapid shooter for intense action play, and 2 Corellian Hound figures to add an extra dimension of battling fun for any LEGO Star Wars fan! • Features an open minifigure cockpit, rear storage hold, multi-stud shooter and hidden wheels for a hover effect. • Also includes Moloch’s blaster pistol. 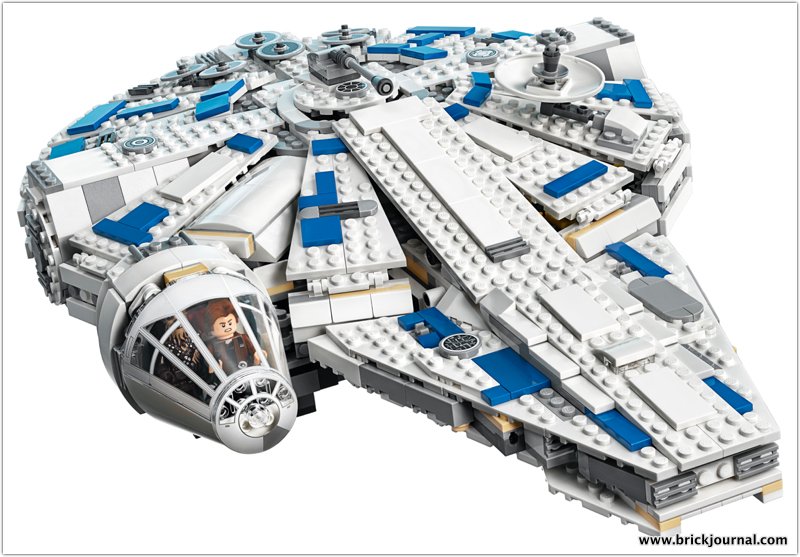 • Play out epic Han Solo movie chase scenes with 75209 Han Solo’s Landspeeder! • This LEGO® Star Wars toy is suitable for ages 8-12. • Measures over 2” (6cm) high, 6” (16cm) long and 4” (11cm) wide. Engage the enemy with the LEGO® Star Wars Imperial TIE Fighter! This brick-built version of the Empire’s iconic attack craft has a highly detailed design, including sturdy wings, opening minifigure cockpit and access hatch, and 2 spring-loaded shooters. This great Star Wars toy also includes 4 minifigures, including Han Solo and Tobias Beckett. • Includes 4 minifigures: an Imperial Pilot, Han Solo, Tobias Beckett and a Mimban Stormtrooper. • Features a highly detailed design including sturdy wings, opening minifigure cockpit and access hatch, plus 2 spring-loaded shooters. • Weapons include a blaster pistol, blaster, blaster rifle and Tobias Beckett’s 2 special blasters. • Recreate epic Han Solo movie action scenes or dream up your own. • Measures over 9” (23cm) high, 7” (20cm) long and 7” (19cm) wide. Travel with Han Solo, Chewbacca and their friends with the LEGO® Star Wars Kessel Run Millennium Falcon. This LEGO brick version of the iconic Corellian freighter from Solo: A Star Wars Story features a 2-minifigure cockpit with detachable canopy, 2 spring-loaded shooters, sensor dish, ramp, rotating top and bottom laser turrets with 2 gunner seats. This amazing Star Wars toy also features opening hull plates for easy access to the detailed interior, which includes a cargo area with couch and Dejarik hologame table, bar, bunk, missile storage compartment, and a buildable hyperdrive with repair tools. Also includes 6 minifigures and a DD-BD droid. • Includes 6 minifigures: Han Solo, Chewbacca, Qi’ra, Lando Calrissian, Kessel Guard and a Kessel Operations Droid, plus a DD-BD droid. • Features a 2-minifigure cockpit with detachable canopy, 2 spring-loaded shooters, sensor dish, ramp, rotating top and bottom laser turrets with 2 minifigure gunner seats, and opening hull plates for easy access to the detailed interior. • Play Chewbacca at Dejarik… but remember he’s a sore loser! Play out exciting adventures with this highly posable LEGO® Star Wars Han Solo buildable figure. This impressive galactic smuggler from Solo: A Star Wars Story features a large blaster weapon with spring-loaded shooter and hip-mounted, detachable blaster pistol. Star Wars fans of any age will love playing with this young LEGO Han Solo buildable toy. • Highly posable Han Solo buildable figure features a large spring-loaded shooter weapon and detachable blaster pistol. • Target enemies with the powerful spring-loaded shooter. • This buildable figure is suitable for ages 9-14. • Stands over 9” (24cm) tall. Take on any adversary with this highly posable LEGO® Star Wars Range Trooper buildable figure. This powerful character from Solo: A Star Wars Story features tough armor and ‘magnetic boot’ detailing, furry shoulder cloak and tunic, as well as a blaster weapon with spring-loaded shooter. Star Wars fans will love battling with this cool LEGO buildable figure. • Highly posable Range Trooper buildable figure features tough armor and ‘magnetic boot’ detailing, furry shoulder cloak and tunic, plus a blaster weapon with spring-loaded shooter. • Engage the enemy with the powerful spring-loaded shooter. This LEGO® BrickHeadz™ 41608 Han Solo is fun to build using colorful LEGO bricks that recreate all of his iconic details from Solo: A Star Wars Story, including a brown jacket and utility belt. He also has a detachable blaster and stands on a buildable collector’s baseplate with BrickHeadz logo for easy display in your home, office or anywhere you like. • Buildable LEGO® BrickHeadz™ construction character featuring Han Solo has authentic details from Solo: A Star Wars Story, including an iconic brown jacket, utility belt and a detachable blaster. • Each LEGO® BrickHeadz™ construction character comes with its own buildable collector’s baseplate featuring the BrickHeadz logo. • Have fun growing your LEGO® BrickHeadz™ collection with other characters from Star Wars, and many more from your favorite TV series, games and comics. This LEGO® BrickHeadz™ 41609 Chewbacca is fun to build using colorful LEGO bricks that recreate all of his iconic details from Solo: A Star Wars Story, including matted fur and ammunition belt. He also has a detachable blaster and stands on a buildable collector’s baseplate with BrickHeadz logo for easy display in your home, office or anywhere you like. • Buildable LEGO® BrickHeadz™ construction character featuring Chewbacca has authentic details from Solo: A Star Wars Story, including matted fur, ammunition belt and a detachable blaster. • Chewbacca toy stands over 2” (7cm) tall without baseplate. ← Collect The Ultimate Long-Range Rebel Starfighter!